Stace at DosCentavos got what he wanted in a Beto O’Rourke immigration ad. In fact, Beto hit Cruz pretty hard. Off the Kuff interviewed Attorney General candidate Justin Nelson, and Harris County Judge candidate Lina Hidalgo. 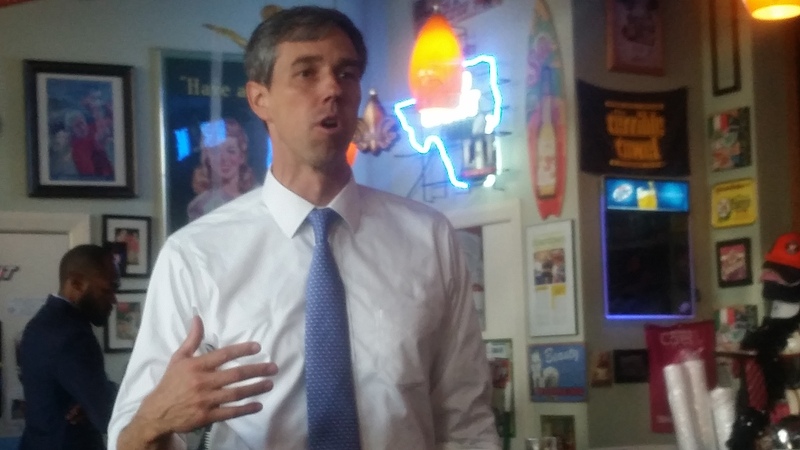 SocraticGadfly was at an education-related campaign forum for a group of statewide and Northeast Texas regional candidates and offers a few takes. Stace reports on a GOTV rally and concert held in Houston’s East End featuring Little Joe y La Familia and a cast of Dem favorites. FYI: Little Joe is like Willie Nelson famous in the Tex-Mex world of music. Grammys and everything. Juanita sees some hope in evangelical women. Paradise in Hell is glad to see the Catholic Church finally releasing names of priests who have been credibly accused of sexual abuse. Rick Casey is skeptical of the latest agreement regarding the Alamo. Therese Odell has had it with Melania Trump. The Current salutes Texas hero Joe Bob Briggs. Finally, the TPA wishes Texas Leftist all the best as it transitions from blogging to podcasting. I have a running joke whenever something occurs at Houston ISD. But Houston ISD’s possible move to place 10 of its schools under a charter corporation whose record is iffy at best is concerning since all of us will be affected in one way or another. The abrupt end to the meeting when the school board decided to have enough public comment on the issue was ugly in that leadership was lacking. Watching (on TV) constituents dragged by HISD police was scary in that you have black and brown and white families being thrown out of a building for which they pay taxes. But much of this could have been avoided at different times. For last night, perhaps HISD’s tactics and rules were a bit much. Fewer seats for the public at meetings; no standing in the room, but there’s an overflow room elsewhere; limited public speaking time; no applause; etc. I remember reading that the gringo school boards did this to Chicanos in my hometown of Crystal City when families were showing up to school board meetings to demand justice from those they elected. The more they showed up, the more rules would trickle out with the hopes of stifling progress and activism. Well, I don’t expect these tactics to work, as they didn’t work then. The bigger problem is a Republican-led Texas Legislature which has failed to fix school finance. Decades of a system designed to ensure poor districts were adequately funded has been met by an economic system that has made the wealthy wealthier, the poor poorer, and the middle class stagnant. And while Houston’s wealthy seem to have provided us with a lot of property wealth that makes Houston ISD seem like a wealthy school district, the bottom line is that the district is 85% black/brown and 75% economically disadvantaged. The wealth hasn’t trickled down. Thus, the current school finance system penalizes a wealthy-looking district like Houston with mostly poor kids in attendance and sends much needed tax dollars elsewhere to districts who are indeed property poor. And no one in charge in Austin seems to want to change this, or even want to achieve any kind of fairness for all. The rules the TEA has imposed on schools–forcing the creation of charter arrangements, threatening to take over school boards-has placed an even bigger burden on the people we elect to create and oversee school policies. To the point where they’ll do just about anything to keep their elected positions, or the access that comes with it. School boards should be siding with the people–in the board room and not just outside after the meeting is ended. This is a great formula which has the least among these three groups fighting for scraps. And a power base that can blame the other two groups (and the groups among them) for all the troubles. Obviously, all of this came to a head at the HISD board meeting last night. And the school board was met with a united front. As much as it seems that last night’s meeting was about someone over-applauding or being loud, the problem is a systemic one that has been avoided by those in power, and, yes, those who fail to vote. Still, one should expect better from elected officials than rules designed to stifle activism and discussion. The Texas Progressive Alliance believes that everyone counts and everyone should be counted as it brings you this week’s roundup. Off the Kuff takes two more looks at precinct data in Harris County from the primary races. Socratic Gadfly offers some updates on what now clearly appears to be a weird triangle in Marlin between Houston real estate “flippers,” a former VA hospital building, and the General Land Office and P. Bush. Neil at All People Have Value again made the point that there is authoritarian/Constitutional crisis on the way. Luke Amphlett criticizes the San Antonio ISD handbook on SB4, the so-called “sanctuary cities” law. Therese Odell sees a chance for the Roseanne reboot to open a national dialogue on important issues, but fears it will take the easy way out. Durrel Douglas unveils a project aimed at placing more Black people on government/NGO Boards and Commissions. The Texas Living Waters Project reminds us that urban wildlife and people need healthy creeks and streams, not channelized ditches. Amy Pearl asks who “walkability” is for. BeyondBones explores the origins of timekeeping. Guest Texan Aviva Shen examines the primary ouster of McLennan County DA Abel Reyna. SAN ANTONIO, TX (02-15-2018) – Texas Talent Musicians Association (TTMA) presents the Tejano Music Awards Fan Fair 2018. Set for March 15-18, 2018. (Thursday–Sunday). Thousands of Tejano Music Fans from across the country will travel to Historic Market Square in Downtown San Antonio for the Tejano Music event of the year. There will be a variety of foods and beverages at this family oriented event as well as crafts booth selling t-shirts, caps various items and face painting for the kids. Fans will get exclusive access to their favorite artists participating in the special autograph sessions featuring Miss Reina Latina San Antonio Sydney Gonzalez and Miss Reina Latina San Antonio Teen Giselle Gomez scheduled during the four days of TMA Fan Fair. The Tejano Music Awards continues to shine each year by producing the largest Tejano Music events in the country. Scheduled to perform this year Michael Salgado, Jay Perez, Stefani Montiel, Los Palominos, Hometown Boys, Ricardo Castillon Y La Diferenzia, Isabel Marie, Ben Ozuna, Sunny Sauceda, Fama, DJ Kane, La Calma, David Farias, Eddie Gonzalez, Ricky Naranjo y Los Gamblers, Joe Bravo, Patsy Torres, Avizo, Conjunto Romo, Adalberto, Rio Jordan, Stephanie Lynn, Da Krazy Pimpz, Boni Mauricio, Bajo Zero, Los Garcias Brothers, Bad Boyz De Valle, Massore Erick y Su Grupo Massore, Carlos y Los Cachorros , Pio Trevino , Xelencia, Augustine Ramirez , Massore, Joe Posada and many more. San Antonio, the “Tejano Music Capital of the World”, will host the 38th Annual Tejano Music Awards Show in the Fall of 2018.